A selection of sliced dry cured ham, sliced cured pork salami and spicy cured pork sausage with smoked paprika and garlic. 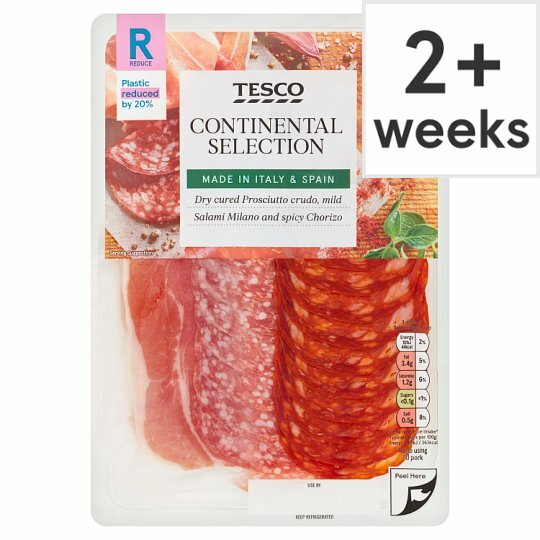 Pork [Leg, Salt, Preservative (Potassium Nitrate)], Salami Milano [Pork, Salt, Dextrose, White Pepper, Antioxidant (Sodium Ascorbate), Preservatives (Potassium Nitrate, Sodium Nitrite), Dried Garlic], Chorizo [Pork, Salt, Smoked Paprika (2%), Dried Skimmed Milk, Dextrose, Garlic, Antioxidant (Sodium Ascorbate), Preservatives (Sodium Nitrite, Potassium Nitrate), Nutmeg, Oregano]. Prosciutto Prepared from 131g of Pork per 100g of Prosciutto, Salami Milano Prepared from 146g of Pork per 100g of Salami Milano, Chorizo Prepared from 125g of Pork per 100g of Chorizo. Sliced dry cured Prosciutto ham. Pork Leg, Salt, Preservative (Potassium Nitrate). Prepared from 131g of Pork per 100g of Prosciutto. Spicy cured pork sausage with smoked paprika and garlic. Pork, Salt, Smoked Paprika (2%), Dried Skimmed Milk, Dextrose, Garlic, Antioxidant (Sodium Ascorbate), Preservatives (Sodium Nitrite, Potassium Nitrate), Nutmeg, Oregano. Prepared from 125g of Pork per 100g of Chorizo. Pork, Salt, Dextrose, White Pepper, Antioxidant (Sodium Ascorbate), Preservatives (Potassium Nitrate, Sodium Nitrite), Dried Garlic. Prepared from 146g of Pork per 100g of Salami Milano.